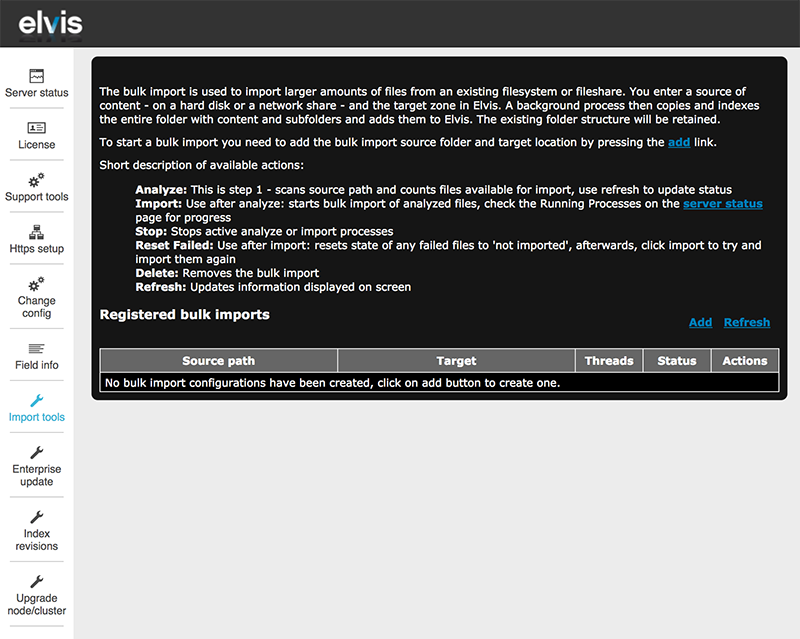 The Bulk Import tool on the Admin pages of Elvis 6 Server is one of the ways of importing files in bulk into Elvis 6. This article explains how to use that tool. A new and improved Import tool is available. See Importing files in bulk using the Import tool of the Elvis 6 Management Console. The Bulk Import tool on the Admin pages has been made obsolete since Elvis 6.16 and has been replaced by the tool available in the Management Console. Step 2. In the menu on the left, click Import Tools. 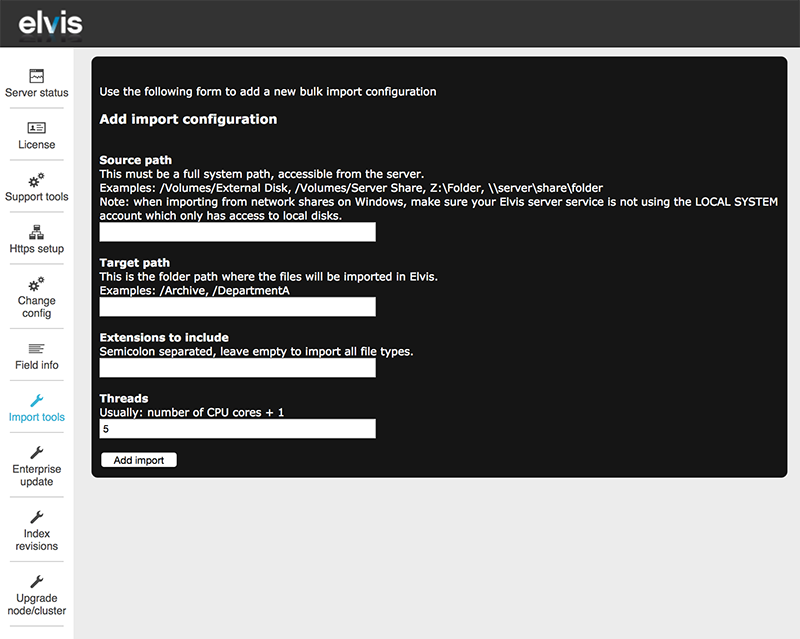 Figure: The Import Tools page in Elvis Server. The Import Configuration page appears. Source folder. Enter the full path to the folder that contains the assets that you want to import. The path must be accessible by the machine that is running Elvis server. Note for Windows users: When using a UNC path to a Windows Share location, make sure you assign a valid user to the Elvis Server Windows service. This is because the default SYSTEM account that is assigned to the service does not have access to network shares, not even to local ones. Target. Enter the main folder (and optionally sub-folder) in Elvis to which the assets need to be added. Note: The original folder will be added to the zone path. For example, if assets are imported from \\Fileserver\Share\Images into /Images, the path for the items will be become /Images/Images/... .
Extensions to include. Add the extensions of the files to include, separated by semicolon (;). Leave blank to import all files. Threads. Define the number of parallel threads that the import process should use. Note: A higher value may speed up the import but can at the same time slow it down when insufficient processing capability is available to handle the higher load. Step 3. Click Add import. The configuration is added, but not yet run. Step 4. To analyze the files that are set to be imported, click Analyze. Note that the status for the import changes to 'analysing'. Step 5. Let the process run for a while and click Refresh and keep clicking it until the status shows as 'stopped'. The total number of files that will be included in the import is shown. Step 6. Click Import to start the import process. Note: It is possible to simultaneously run multiple bulk imports. Step 7. Let the process run for a while and click Refresh. During the import process, the status shows as 'importing'. The number of imported files and the number of failed files are displayed. When the process is completed the status appears as 'Import finished'. Click Stop to pause the import. To resume it again, click Import. Note: Bulk imports are preserved between server restarts. Click Reset failed to retry importing files that failed to import. When some files failed to import, check the Server logs to see what caused them to fail. If the cause was temporary in nature, retry importing only the failed files by clicking 'Reset failed'. This will set the status of the failed files to 'not imported yet'. The files can then be imported by clicking 'Import'. 5 June 2018: Added a note stating that the Bulk Import tool in the Admin pages has been made obsolete since Elvis 6.16.